Washington D.C. quartet SHARK WEEK have just released their debut 7″ on Analog Edition Records. Named after the neighborhood in Puerto Rico that it was recorded in, Santurce comes bearing a soulful and flavorful strand of rock. 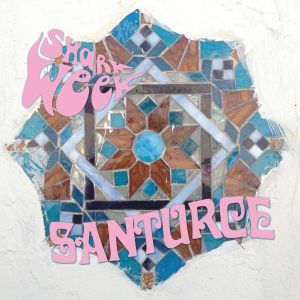 Thinking back to their EP from 2012, Shark Week have dialed it in and really honed in on a sound of their own with Santurce. These songs are led by the raspy, old-souled crooning of Ryan Mitchell, followed by a sunny and jangly form of garage rock. Both songs end up leaving you with a refreshing, tropical-flavored aftertaste, stemming from a string of sparkly, gem-like guitar tones. The desert-bound “Go West” picks up after a slow-dragging intro with peyote-induced rhythms and glinting guitar twangs, serving up just the right amount of haze for this triumphant desert anthem. “Baby Maybe” comes effortlessly weaved around a blend of soaring vocal coo’s, much like the sun is shining high in the sky as the seagulls float above your head. It’s hard to wear a frown as the breezy rock scatters the hair across your face, so naturally we wouldn’t want you to miss out on these songs below. Get on that, then snag the color vinyl from Analog Edition – there’s only 200! BUY the 7″ directly from Analog Edition – blue vinyl limited to 200 ! Posted on September 17, 2013 by styrofoamdronePosted in 7", Reviews, Still Spinnin'Tagged alternative, garage rock, surf rock.